South Jakarta Cooperative Small Medium Enterprises and Trade (KUKMP) Sub-department provides training for 100 small medium enterprises (UKM)s to learn about business capital, opportunities analysis, and running business through online media.
" 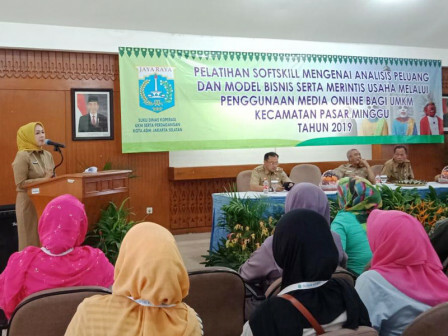 This training is held to develop their soft skills"
"This training is held to develop their soft skills," mentioned South Jakarta KUKMP Sub-department Head, Shita Dhamayanti at Pancoran Sub-district Office, Monday (4/8). In this chance, she also said eight classes are expected to complete their training in this September. Sulistiawati, Cilandak resident who participate in this training hopes to gain more skills thus she can develop her food business. "I sell variety of soto dishes in Gerai Tali and I hope in the future KUKMP Sub-department can help promoting it," she expressed.